“Dad” is a very special word in my lexicon, though I think perhaps my sense and attributions and nuanced feelings of the word carry few of the common cultural stereotypes. For my dad was not the breadwinner, or the head of the household, or the fearful patriarch. Never did he mete out punishment, raise his voice, or lay down the law. 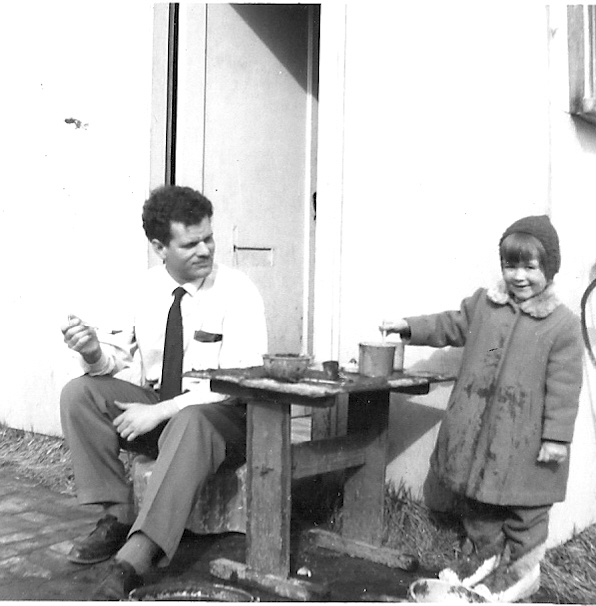 My earliest memories of dad…He is building my playhouse, and I help. He is putting up my swing set, and filling the big pool. He is taking us to the lake to swim on a very hot summers’ day. Always, always, when he comes home from work he plays with me. On Saturdays, we go to the Crown Point hotel for orange floats – was there ever anything so delicious? We hike, and explore, and bash rocks. (He liked to prospect in his spare time.) He makes me a hot drink every night before bed: brewer’s yeast, molasses, and boiling water. His best friend Les is always at our house, and he is as kind and funny as my dad. Even when I was very young, I understood that my dad was different. For at my best friend’s house, we were told to be quiet and stay out of the living room when her dad came home. At another friend’s house for dinner, her dad helped himself first and everyone else waited. (At my house, my dad made sure his kids ate first.) 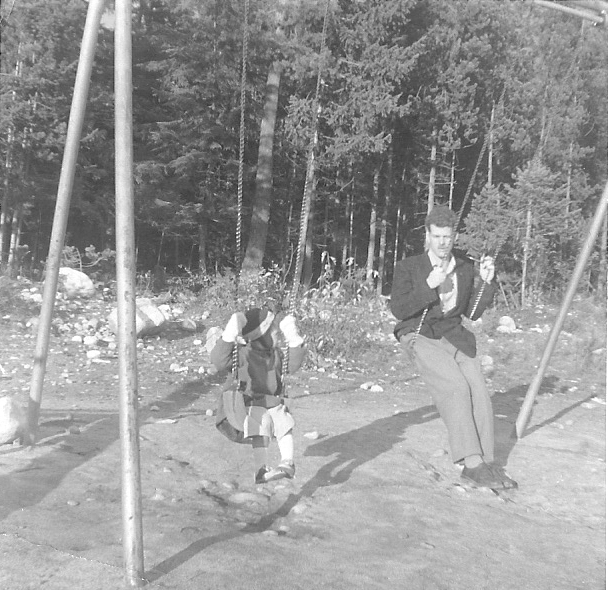 Dads were a little distant, and a little fearful in those days, and often reflected the privilege of being male. In fact, my only remembrance of my dad raising his voice was to a male houseguest of ours: “Don’t yell at my daughter!” I was eleven, and it was the first time I remember him angry at a person. My dad was political, though in a distinctly non-partisan way – he spoke of the cruelty and injustices of the economic system, and the failures and foibles of the politicians, of the way that things might change for the better. When he spoke of these things, we understood that he was speaking of a more egalitarian, democratic society, a culture and an economy that was built around the needs of all people. At the age of ten, we listened together to the federal election results on the car radio – even while on a family vacation – and the importance of thinking about, and participating in the political ideas of the country was forever ingrained in me, along with a love of CBC Radio. Even when he was deeply serious, however, humour and playfulness were never absent. I am not sure how old my dad was when he built his model railroad village in his basement – somewhere around the age of retirement, anyway. He said he’d always wanted a train set as a kid, and so he built an elaborate one, complete with tunnel through the adjoining pantry storage, and incredibly detailed village, town, and scenery – a model of whimsy and creativity and play that I hold in my heart with a smile. Of course, us kids were all adults then, but we all remember playing trains with dad. When my dad died, among other things he left a carefully collected library of some five thousand books, and I remember looking over and choosing books with a visceral imprint of the intellectual legacy I’d been left: the greatest authors of five decades, fiction and non-fiction, but above all, the world’s great thinkers. As time passed, however, I came to see my dad’s legacy in an even more tangible way: my brothers’ kindness, humour, and patience with their kids, love shining out of their faces. Above all else, dad, I remember you laughing, and I do look at the stars at night and hear you laughing. I am grateful for the love of learning, the love of the wild places, and the teaching of kindness in everything…my heartbreak remembers your laughter, and is comforted. See you over there.